Potato chips always seemed like such a risky snack after my older brother explained that the green ones were poison. You couldn’t just mindlessly watch cartoons and eat them like popcorn. Each chip had to be carefully examined. Hold it up to the light and make sure to check both sides. Best to just leave them to the experts and enjoy life. I don’t know, I’ve run across some mean lettuce. Oh, and the most mean-spirited “food” I’ve come across was the butter on the small table with the bread at the school lunch. That butter lived a life of its own, because it was on the table until it got warm and almost melted, and then we got to face the same angry butter for the next couple of days until the little plastic box it was in was empty. The butter was evil, I tell you all! If your spaghetti does that you might want to check the best-before date. Did he hire the Swedish Chef from the muppets? 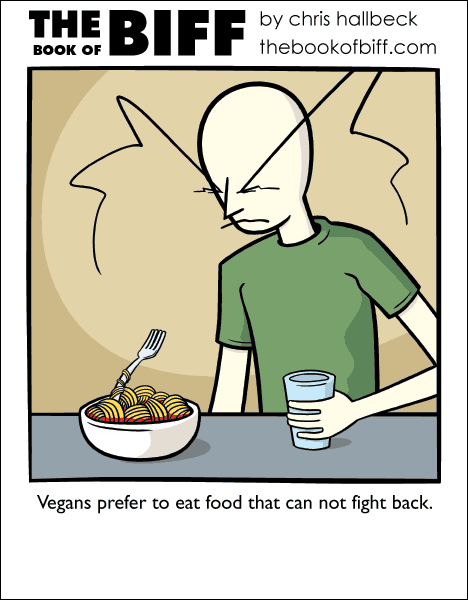 Pasta itself is vegan, but be careful if the wheat is grown near any nuclear facility. It depends what you feed the chicken of course. You ever See/Read Scott Pilgrim Chris? Just he movie, I can’t stand those “comics”. Had vermicelli and maranara sauce tonight. I had tackled some bad cheese…I won the fight, but not without a struggle.